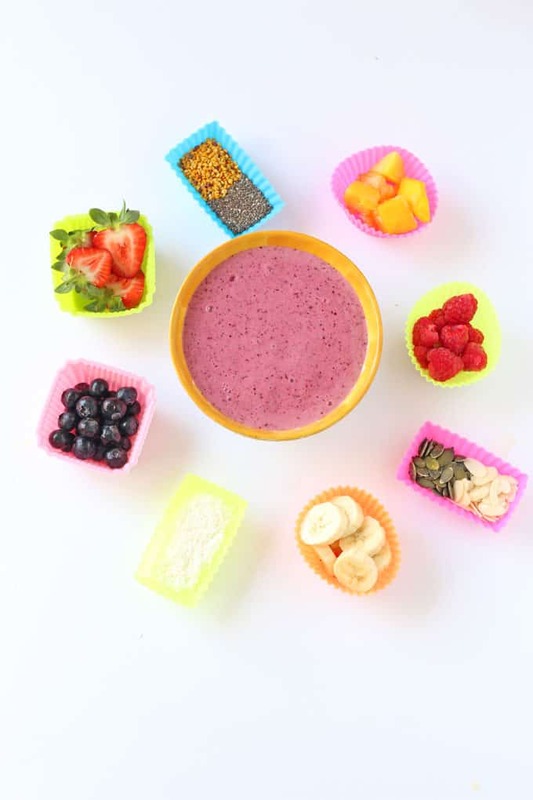 This super healthy DIY Smoothie Bowl for Kids is a great way of getting your kids involved in and excited about what they are eating! Is it just me or does anyone else get stuck in a bit of a breakfast rut sometimes? During the week breakfast is always a frenzied affair in my house as I scramble to get the kids up, dressed, fed and out the door on time. As a result I usually serve up the same trusty breakfast staples that I know the kids will eat without too much of a fuss. But come the weekend I try to get a bit more creative with our breakfasts and use the calmer mornings to entice them to try new things. 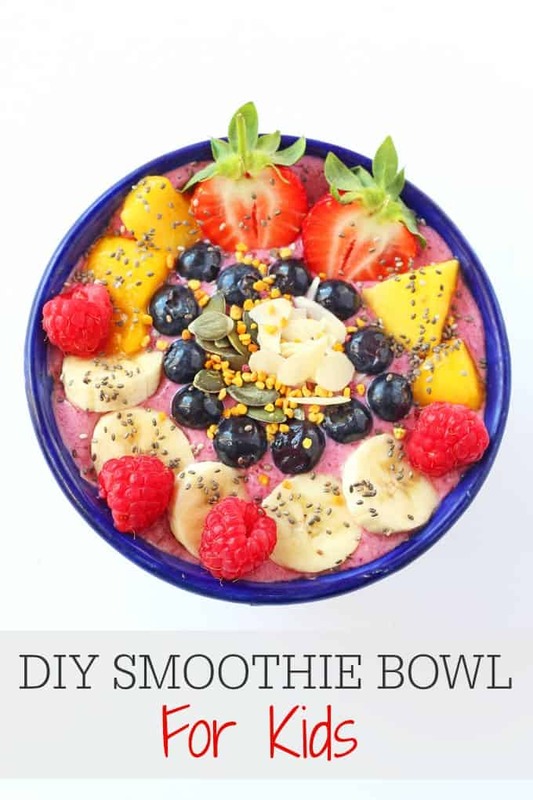 And a new favourite of ours are these DIY Smoothie Bowls! 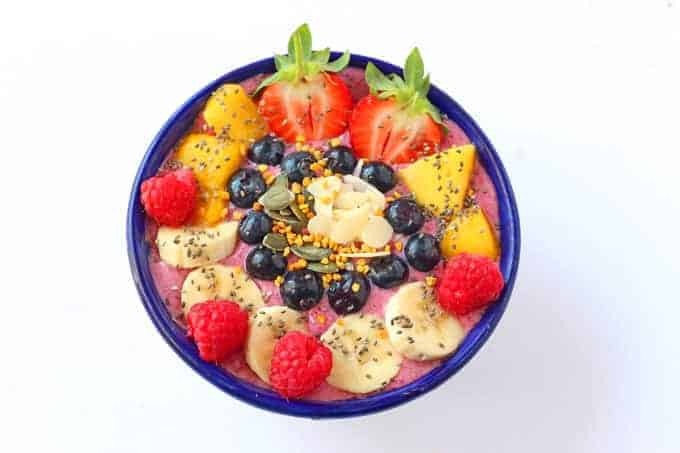 If you are not familiar with a smoothie bowl it is basically just a smoothie in a bowl, made a little thicker so you eat it with a spoon rather than drink it. You can then decorate it with a whole host of different toppings; from chopped fruit to nuts and seeds, even cacao nibs and coconut! My fussy eater isn’t a massive fan of smoothies but these smoothie bowls have been a great way of getting her to eat the same ingredients. 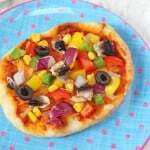 They are also a fantastic way of getting your kids involved in and excited about their food. They will have so much fun choosing their toppings and decorating their bowls that they won’t even realise they are eating something super healthy for breakfast! I used frozen mixed berries for the actual smoothie but you can pretty much use any fruit you wish, fresh or frozen. 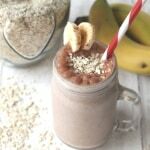 I do however recommend still using frozen (or at least partly frozen) bananas as these help to make the smoothie thick in consistency. 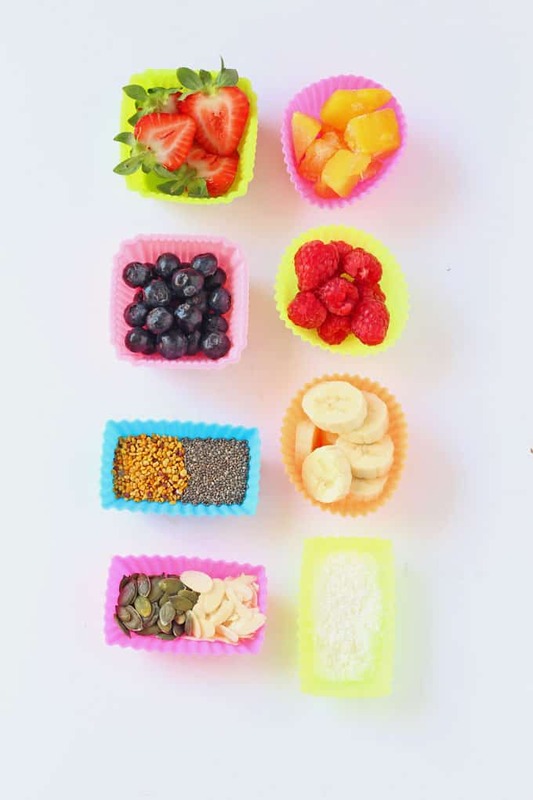 Get the kids more involved in making their meals with these DIY Smoothie Bowls! Place all the smoothie ingredients in a blender and blitz until well combined. You can add a little extra milk if the mixture seems too thick. 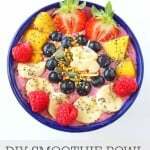 Divide the smoothie into 3 bowls and place on the table with your chosen toppings. Let the kids loose to decorate and eat their DIY Smoothie Bowls! So pretty and the kids had so much fun making their own breakfast bowls this weekend! Love it. What a beautiful looking bowl. I love smoothie bowls, as it feels like much more of a meal that just drinking a smoothie out of a glass. Yes!!! That’s exactly how I think too. It definitely feels more substantial eating it rather than drinking! Thanks Nadia. 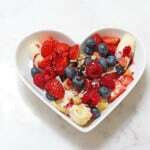 I have to admit I’m partial to a smoothie bowl myself for breakfast!